So, you're stuck in another catch-22 situation. You want to move on to the next level of your career, something which involves management but you find it difficult as you have little or no experience of management. And you can't get experience without having the job. Many people are stuck in positions like this and it can be frustrating. You can either save up and pursue a qualification on you own time and dime or you can get creative and look for experience elsewhere. Anyone who has read this blog knows that I'm a big fan of MOOCs. They allow you to learn where and when you need to and cover a variety of topics. One thing MOOCs are really good at is fulfilling a specific training need - in this case management training. I'm currently taking a course via FutureLearn called Managing People: Engaging Your Workforce which I'm finding both engaging and interesting. The course features a lot of opportunity for interaction and discussion and makes me think about some of the issues I've previously taken for granted. There are plenty more business/management MOOCs available so even if you can't commit to one at the moment there will likely be another opportunity in the future. A good list of management related MOOCs can be found on Class Central. This is also something easy to fit into your everyday commitments. Do you have a commute? A spare lunch hour once a week? Why not do something productive with your time and read a management book. They're not always as dry as they seem and they can produce some really valuable advice. Something which gets you to think and reflect is always good. Many of these books can be purchased cheaply, either second hand or through apps such as Kindle. And of course there is always the local library! As with any sort of professional reading I would advise you to make notes about what you read - not only does it make it easier to remember the information but it helps you to really absorb it and relate it to your own experiences. Why not get together with others to discuss what you read? This can be done in person by setting up a reading group or joining in with an online group such as the Library Leadership Reading Group on Twitter. Writing book reviews is also a good way to reflect. The O'Reilly Reader Review Program offers bloggers a chance to read books on management and leadership in return for reviews. It's worth remembering that experience doesn't have to be in the workplace. Volunteering on a committee can be a valuable way to develop management skills such as negotiation, communication and people skills. For those in the library profession CILIP committees are always an option but there are many more ways to get involved. Perhaps you could join a group at work or an organisation you support or why not help to organise an event? There are many ways of gaining the skills used in management without actually being a manager and you get to make new friends/contacts at the same time. This is another important skill and again, something that doesn't have to be developed in a formal way. I like to help colleagues with their CPD so if I see something that might be of interest then I pass it on. I also act as a sounding board when people have advice/problems (as other people have done for me). If you're Chartered then CILIP mentoring is also an option. I think that mentoring is something really important and can show you the kind of manager you would make. It's important to remember that management is about people as well as productivity. Why not see if it's possible to shadow your manager or a manager in another department? What they do on a daily basis may surprise you. If shadowing someone isn't appropriate then why not just try observing someone who you think is a good manager to see how they handle things? You can also observe those you think are bad managers in order to learn what NOT to do! Again, the important thing is that you make a note of your experiences and use them for later reflection. I'm sure there are many, many other ways of developing management skills on little or no budget but these are just the examples I can think of off the top of my head. If anyone can think of things to add then please share them in the comments section below. Remember that leadership and management are two different things. You don't have to be a manager to be a leader and you don't have to be a manager to look at developing some of the skill set. Hopefully even if I don't decide to pursue a formal management qualification there are still ways for me to develop the skills that will lead to my next career step, management or otherwise! Interesting post! I'm fortunate (!) enough to have had plenty of management experience (approx 10 years in public and private sectors - former in retail, later in libraries), although I am currently in a non-management role (subject librarian). I guess the only other thing to add is related to your coaching/mentoring point. If you have library assistants, they are good people to delegate to as well as to help them develop (particularly if they are in that pre-qualified state and looking to qualify). If you can give them experience of the things you do, delegate appropriately etc, then you can demonstrate the management/development skills that will be beneficial when it comes to moving to a management post. Getting into the habit of delegating has a nice side-effect too. I delegated a heck of a lot as a manager - both to manage my workload and to develop others. If you can get into that mode of thinking early so it becomes habit, you will reap the benefits personally and professionally. Provided, of course, you delegate appropriately! Thanks Ian. I agree that this is an important skill to develop and something I hope to work on in the future. I regularly deal with staff at work who are looking to attend library courses and ask for my advice. I try to help them as much as I can and also try to encourage then to pursue projects which I think will help them such as doing presentations. I must make more of this in future job applications I think! Good post! I think you have explored some excellent avenues for gaining management experience/knowledge. From my personal experience, I would echo Ian's response regarding showing management and leadership qualities. I think if you show that you can do things like delegate, make decisions effectively, resolve problems, behave professionally and demonstrate influencing and interpersonal skills, it can make a real difference as it shows to your colleagues (particularly your managers) that you have the ability to take that next step up. Good point Sarah. 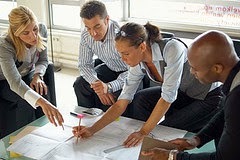 I agree that developing the qualities of a manager is just as important as the qualification or management experience. I think I'm going to start keeping a record of things that I do which demonstrate these qualities ready for the next job application. Couple of other thoughts regarding training opportunities. - Don't be shy of letting others know that you are interested in training opportunities. If people know you are interested they are more likely to think of you if an opportunity arises. Don't assume they already know. Thanks Chris. I've let my employers know that I'd like to do some training but unfortunately it's not available to me on my current grade. Hopefully I can keep developing the skills I need and demonstrate this to my employers which will put me in a better position if a promotion opportunity arises. Fingers crossed!